Strawberry Road: Just a Peak at My Queen of Hearts! 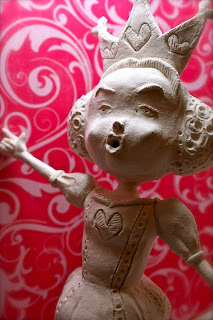 Here is my unfinished Paper Clay creation of The Queen of Hearts. The past few weeks I have been incredibly busy with work and rehearsals and I managed to squeeze in a Paper Clay Date with my mamacita! This is my first attempt at a Queen! As I have previously posted, I have made a fairy, skellies and snowmen, and now I can add this lady to the mix! Just imagine her saying, "OFF WITH HER HEAD!" To see more Paper Clay creations check out The Polka Dot Pixie's Blog here. I have taken 4 of her classes and really enjoy her laid back and positive teaching style! WOW girl this is going to look AMAZING! WOW...the detail is awesome - I can hear her shriek! I <3 her!!! Love to see all your creations! Wow!!! I love your Queen! I went and checked out Jenny's Blog and I am going to take one of her classes in March when she will be teaching in San Diego. I hope my creations will turn out half as good as yours. Can't wait to see her painted! OMG Portia, she is totally amazing...you are such an amazing artist. Good luck with rehearsals and all your shows. We will miss you on TI.